Are you having some problems? Let's see if some of these tips will help to answer your questions and maybe give you some ideas for other things you can try with these files. If you get really stuck on a problem, you can send us a note using the question form on the Ask a Biologist web site. The first set of files are in PDF format and require the free Adobe reader plug-in or compatible program to print them. If you do not have the plug-in you can get it directly from the Adobe Reader Download Page. 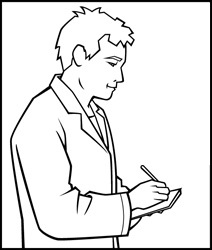 The PDF files allow students to workout their own stories without the use of computer. All that will be required are scissors, paper, glues, and if they want to add color to their story, coloring pencils. If you want to save the files on your computer you can either use the save command available in your browser when you click on each file, or you can click on the file link using the right mouse button and either "Save Target As" or "Save Link As" to save to a location of you choice. Be sure to remember where you save the files. The digital files contain a collection of the clipart images found on the PDF files and are organized based the security reports. The clipart files are in GIF format and can be used in most programs. There are two different sets of files based on which computer platform you are using, PC, or Mac. The PC download is a self extracting file that requires no additional software to open and save in the folder of your choice. The Mac version requires a helping program that is standard on all Macintosh systems called Stuffit. Once downloaded it can be uncompressed and the files stored in the folder of your choice. The digital files work well for use with other computer programs, such as Microsoft PowerPoint or for the fine arts, Adobe Photoshop, or Adobe Illustrator. For schools that are not able to use these products for budget reasons, other free software such as Open Office can be downloaded and used to create quality digital presentations. More about these programs can be found in the next section. One advantage of the digital clipart is that the files can be imported into other presentation and graphic art programs. Once imported, the files can be sized and text can be added to complete the process of creating the story. 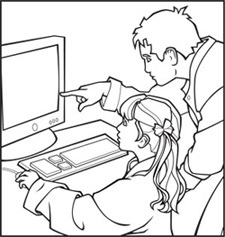 Depending on the programs that are available, color can also be added to the clipart to add some pop to the story. In addition to software that requires a fee, there is also the OpenOffice suite that can be downloaded and used for educational purposes without charge. Open Office has a very nice presentation program that easily substitutes for Microsoft PowerPoint. Below is a short listing of the programs that can be used with the clipart and in some cases the location to download the software. This is by no means, all the types of software that these files can be used in. In fact, most word processing software will also import the GIF files from this activity. GIf files are called indexed color files. In most cases, indexed color files are more restrictive for adding color and sizing the images without losing some image quality. If you plan to import the images and color them in graphic art programs such as Adobe Illustrator or Adobe Photoshop, be sure to convert the file "mode" from "Indexed" to "RGB", or "CMYK" to insure the highest quality output of the images.